Here you can learn about what we do, discover who is in the group and what they are doing, find links to our publications on the navigation bar above, browse our software and databases and take a look at some of our group videos. The Figure is an example from our work to understand variation at the protein residue level based on data from human genome and exome sequencing. 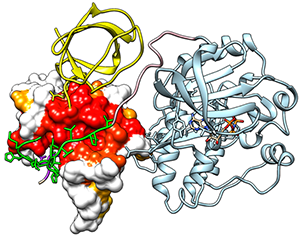 Here, the most constrained positions within an SH2 domain are mapped onto the 3D structure of the tyrosine-protein kinase src, with red highlighting the most constrained positions. For the latest news from the group, please see our twitter feed. We are pleased that our resources including Jalview and other Dundee Resources such as JPred have been selected after competition to be UK Tier 1 Resources in the Elixir Network. Our core funding to support research and development of Jalview, Jpred and related software is from the BBSRC and Wellcome Trust. For details of other current and past funding, see our people pages. We have a longstanding BBSRC funded collaboration with Prof Gordon Simpson on RNA processing. This has included pioneering work on the analysis of RNA expression and polyadenylation in plants by Direct RNA Sequencing, much of which is encapsulated in our polyAdb database. We collaborate closely with the lab of Prof Sara Brown on human skin disease . The most prominent outreach activity from our group over the last few years has been the GenomeScroller exhibit. Our essay on The UK Academic System (Now Version 4.0 July 2018) aims to help people to understand how scientific careers develop, what the terms Reader and Professor mean in the UK, how scientists fund and publish their work and how they are assessed.